Okay... So today I have for you my dear purple-loving friend and bloggie-land 'sister'... Kari from PurpleFuntastick Creations!! Kari and I met through a Blog Hop we were both in several months ago -- Her kind heart and spirit made us instant friends, and I have enjoyed getting to know her better ever since... Kari is dependable and loyal. She does everything she can to stay positive, and that's one of my favorite things about her!! She has some really creative ideas, so I hope you'll stop over to visit her soon!! And now, without further ado... I give you Kari from PurpleFuntastick Creations!! For those of you of who don't know me ..my name is Kari Sanchez and I am a single mom of two wonderful boys who are smart and talented. My oldest Steven is in college (Marketing Mgr) and works too and Josh is my last and he is a Senior in High School (sniffles) but a jock at heart and a football player at heart and we love to watch football!! :) I am a full-time mom and student studying Pastoral. 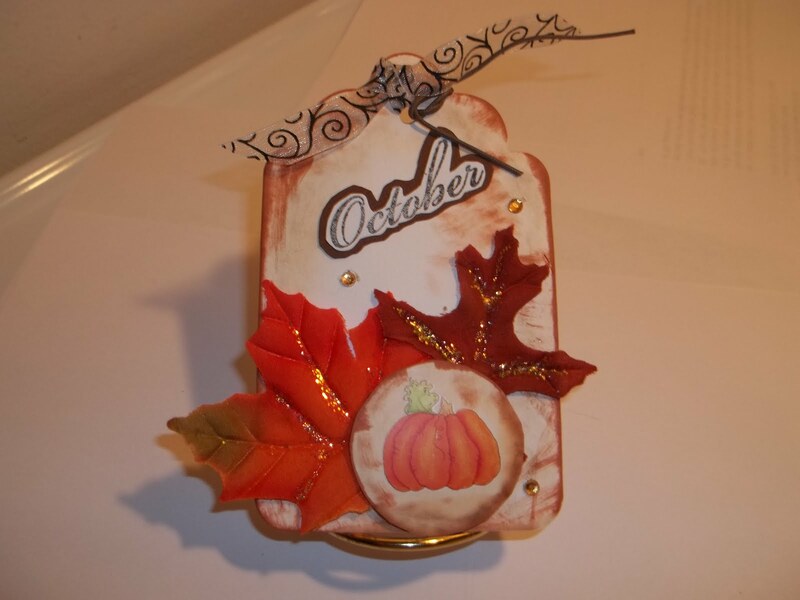 I have been crafting for over many many years and I love it ...it is a great de-stressor for me and I love to do all kinds of things but cardmaking is dear to my heart but I love making LOs, tags and altered art. I also make jewelry and other kinds of stuff to give as gifts. I love helping people and showing my passion.I am big showing that I am a believer in Lord Jesus who is my Savior. I also love to cook and do things with my friends. Welcome, Kari! Your tag is so adorable! Beautiful tag! I love the Stickles on the leaves. Beautiful tag!! I thinks tags for all the seasons would be gorgeous!! Your Fall tag is so cute. Love the leaves on it! great tag. visited kari's blog. left a comment and became a follower. Great tag Kari ---- wonderful to see the beautiful fall colors after all this heat!!! Awesome project Kari. I am so impressed with all the amazing talent.